The pub is about four minutes walk from West Brompton tube station – which has London Overground and Underground services. The pub has a full food menu with a Sunday roast on offer. 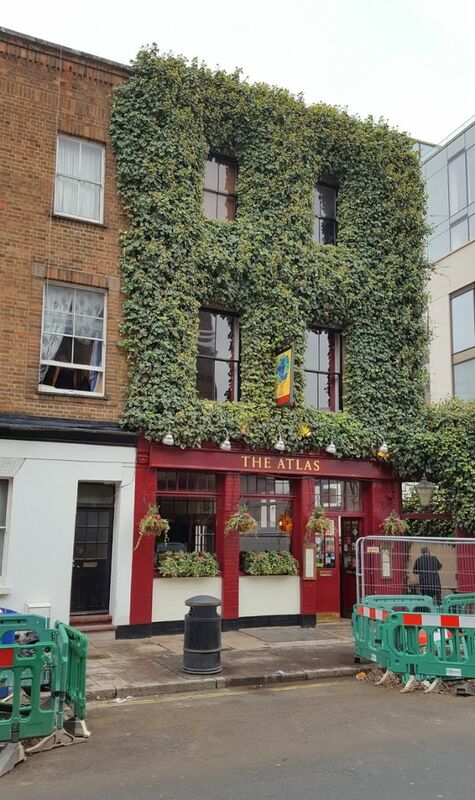 Their regular real ale is Timothy Taylor Landlord, and there will be several other beers there on the day. Also they have lagers, cider, wines, etc as you would expect from a pub. What we might term the Bron- Yr- Aur chill out bar is to the left – this has a bar, seats and sofas and will be ideal for catching up, chilling out and discussing the obvious topics etc. To the right, there is an adjoining room with a large screen and this is were we will stage the main events – DVD playbacks, footage, guest speaker slots and the quiz. 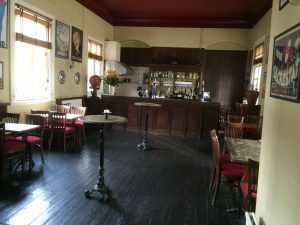 Julian and I visited the pub to look everything over on Tuesday – it’s an excellent pub with very friendly staff and an inviting atmosphere. 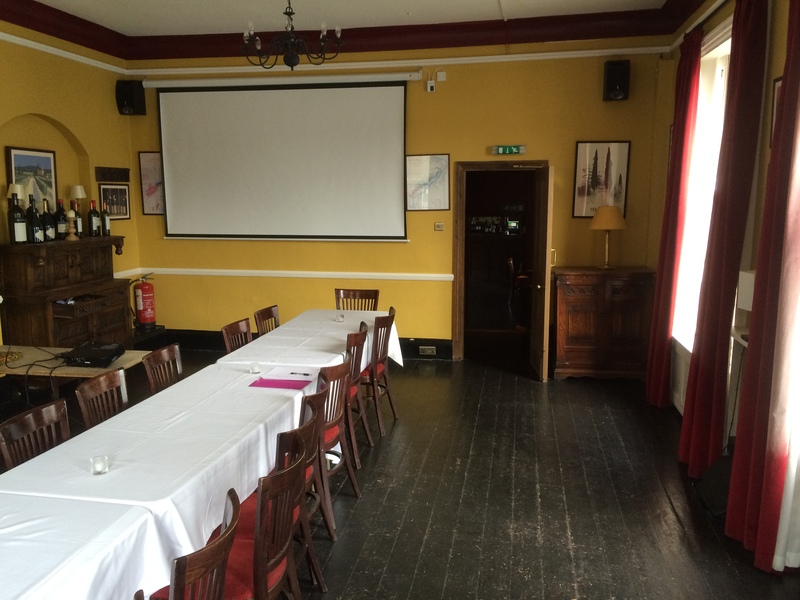 The two function rooms will be ideal for what we want to do. That is celebrate this milestone Led Zeppelin anniversary with like minded people and have a whole lotta fun doing so. This is to cover the hire of the rooms and our admin costs. 2pm – 4pm -Introduction/various footage /news footage/ official rehearsal footage etc. 5pm -6pm – The 02 Reunion Quiz – prizes to be won! 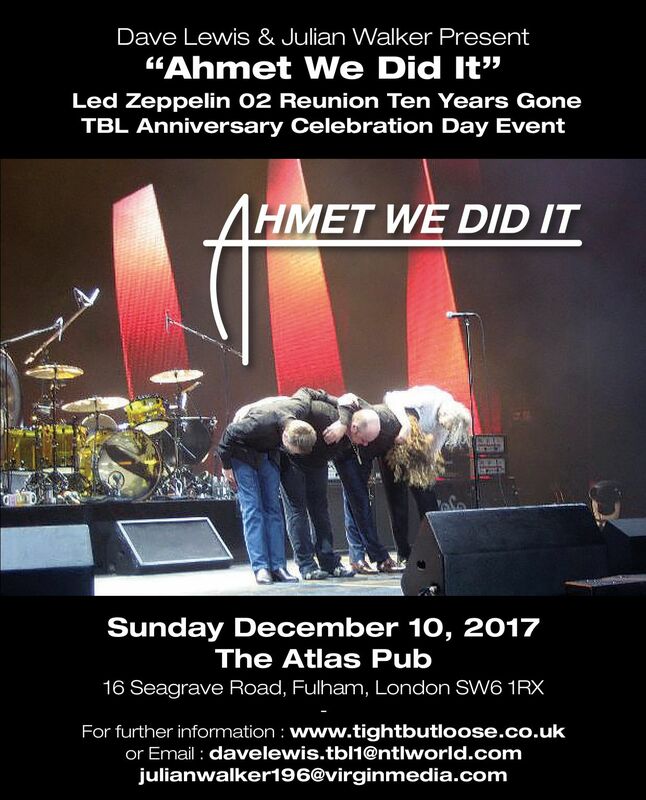 So join us for a day and night of events to celebrate the tenth anniversary of the historic Led Zeppelin’s 02 reunion for the memory of Ahmet Ertegun. A unique TBL Led Zeppelin fan gathering staged exactly ten years gone from that night of nights. Ten years on let’s celebrate that fact all over again…. Please note if you require more than one ticket just make an additional order for each ticket -there is not a facility for multiple orders. I will send you a PDF ticket to confirm your attendance. This will need to be presented on the day at the pub. Also please print out the confirmation E-mail I will send with the PDF attachment and bring that along too. You will require both the ticket and a copy of the E-mail confirmation to gain entry. Please note – there is a ceiling limit on how many we can accommodate, so be sure order your tickets AS SOON AS POSSIBLE to ensure entry. This is a great opportunity to get together and celebrate that night of nights. We are trying to keep it all fairly simple – and there’s nothing too grand or complex just a great opportunity to gather like minded fans together and celebrate that night of nights -and prepare for the 50th anniversary. It’s a good while since we have had a formal event of this kind – as mentioned we are asking a nominal fee and we would encourage you to order the ticket as soon as possible – this will secure your entry and give us a good idea of numbers attending. Further updates on all this will follow in the coming weeks. Many thanks to Wyatt Brake for the 02 Reunion photo. I am pleased to announce that the recent TBL issue 43 is now available as a digital download for iPad and Android formats via the Magzter Digital Newsstand . The Magzter Digital Newsstand is one of the leading multi platform digital newsstand, with 6,000 magazines from 2,500 publishers globally available for sale. The Tight But Loose magazine has long been established as the key regular Zep written source. The publiation of the magazine in digital format via the Magzster Newsstand offers online readers access to this essential Zep read at the mere touch of a screen. 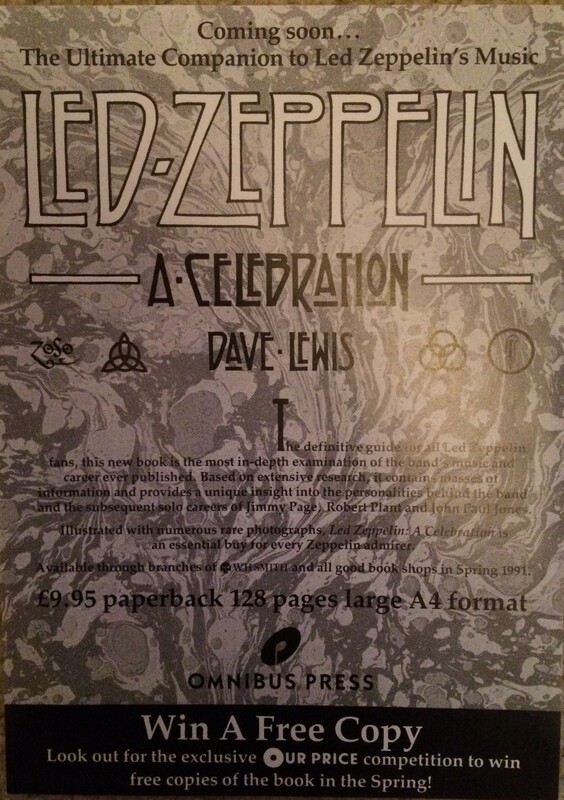 Each issue adds a fresh perspective to thee appreciation of all things Led Zeppelin. This is a companion digital offer designed to run in conjunction with the physical product. The printed version of the TBL magazine remains at the core of the TBL offer – a 32 page full colour printed edition, individually signed and numbered with a free additional 10 x 8 art print. To make it clear – there are no plans to cease the TBL printed mag -this will continue to be published in all its 32 page glory! However, the digital version brings additional accessibility to the content. I am sure current subscribers will continue to desire the collectability of the physical product and add the digital version as a convenient method of reading the magazine. In effect you need both! In linking up with the Magzter Newsstand, I am also hoping it will drive new readers to the magazine and in general, spread the TBL world to a far reaching audience. Indeed if you know of fans who favour online reading be sure to spread this message to them. 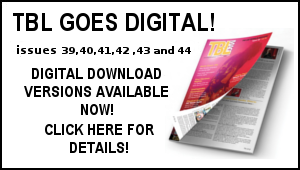 If you are reading this and have never indulged in the TBL magazine – the digital version now makes it very easy to do so at the click of the link below. The ordering link is below. Previous issues TBL 39, 40 and 41 are also available to download. 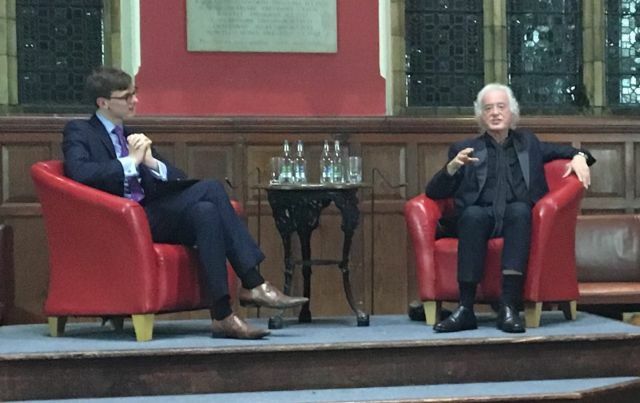 Jimmy Page gave a talk at the Oxford Union about his career on October 23. We’ve collected together photos, a video, and quotes of Page’s talk here. A letter from former Red Hot Chili Peppers guitarist John Frusciante to Jimmy Page is being sold on eBay. 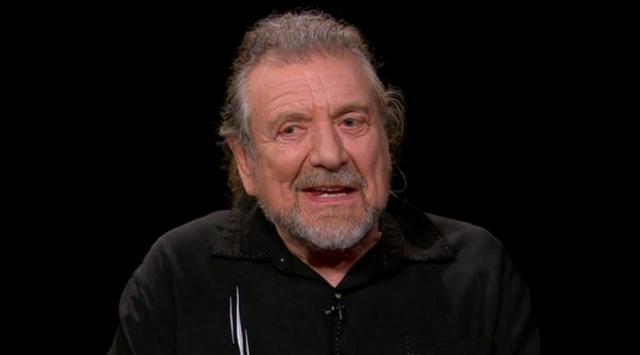 Robert Plant appeared on Charlie Rose’s show on October 26. He talked about his new solo album “Carry Fire” as well as Led Zeppelin. You can watch the full interview here. Robert Plant reportedly made a “very generous” donation to a charity which aims to research a cure for leukaemia. November 5 – “Yardbirds ’68” by The Yardbirds will be released. November 16 – Robert Plant will perform in Plymouth. November 17 – Robert Plant will perform in Bristol. November 20 – Robert Plant will perform in Wolverhampton. November 22 – Robert Plant will perform in Llandudno. November 24 – Robert Plant will perform in Newcastle. November 25 – Robert Plant will perform in Liverpool. November 27 – Robert Plant will perform in Glasgow. November 28 – Robert Plant will perform in Perth. November 30 – Robert Plant will perform in Manchester. December 2 – Robert Plant will perform in Belfast. December 3 – Robert Plant will perform in Dublin. December 6 – Robert Plant will perform in Sheffield. December 8 – Robert Plant will perform in London. December 11 – Robert Plant will perform in Portsmouth. December 12 – Robert Plant will perform in Birmingham. February 9 – Robert Plant will perform in Raleigh, North Carolina. February 11 – Robert Plant will perform in Charlotte, North Carolina. February 12 – Robert Plant will perform in Norfolk, Virginia. February 14 – Robert Plant will perform in New York. February 16 – Robert Plant will perform in Boston, Massachusetts. February 17 – Robert Plant will perform in Toronto, Ontario. February 20 – Robert Plant will perform in Chicago, Illinois. February 22 – Robert Plant will perform in Minneapolis, Minnesota. February 24 – Robert Plant will perform in Denver, Colorado. February 26 – Robert Plant will perform in Phoenix, Arizona. February 28 – Robert Plant will perform in Oakland, California. March 2 – Robert Plant will perform in Los Angeles, California. March 26 – Robert Plant will perform in Sydney, Australia. March 27 – Robert Plant will perform in Sydney, Australia. March 30 – Robert Plant will perform at the Byron Bay Bluesfest in Australia. April 1 – Robert Plant will perform in Melbourne, Australia. April 2 – Robert Plant will perform in Melbourne, Australia. April 8 – Robert Plant will perform in Perth, Australia. Here’s a look back to the release of the Remasters set in 1990 -all of 27 years ago this week. An absolutely crucial release that put them right back in the spotlight…. 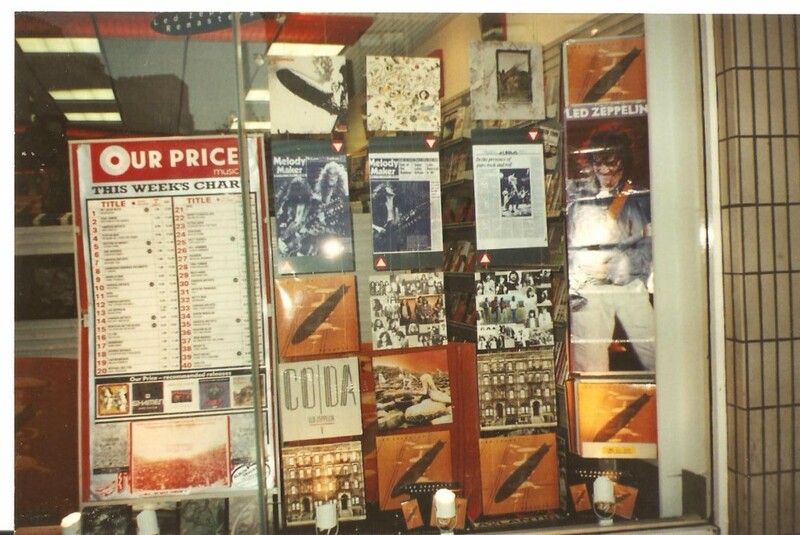 It’s amazing to think that there was a time back in the day, that the only way of hearing Led Zeppelin’s music was via the ten original albums – ie the eight original studio albums, The Song Remains The Same soundtrack and the posthumous collection Coda. 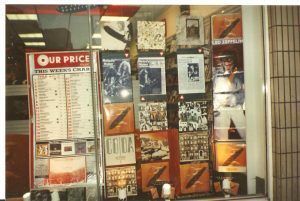 True the Led Zeppelin catalogue had been released on CD – alebit not from the original masters and transferred via analogue tapes. I did a feature in Record Collector in early 1990 reviewing the original CD’s (I’ll need to dig that one out) ,blisterfully unaware that Jimmy was about to overhaul the entire catalogue for CD. 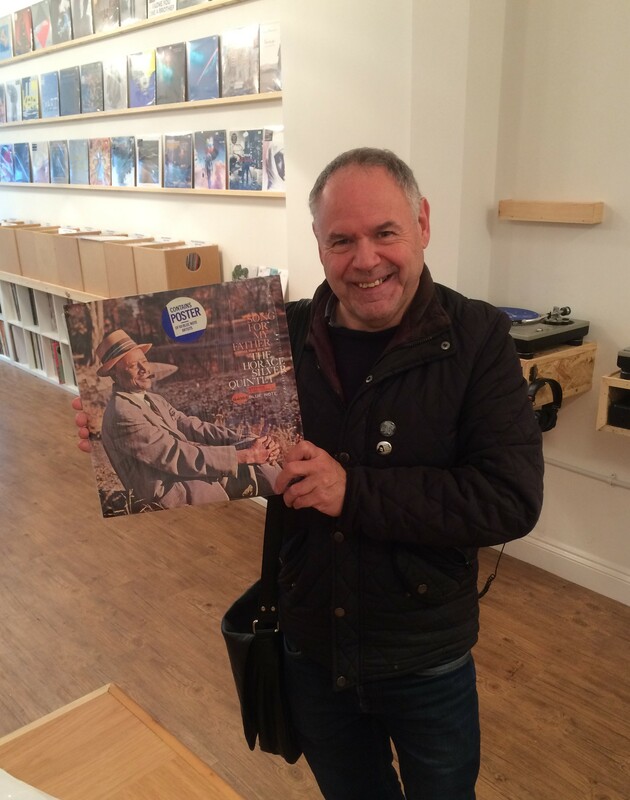 I did another feature on the release of the box set for Record Collector in November. 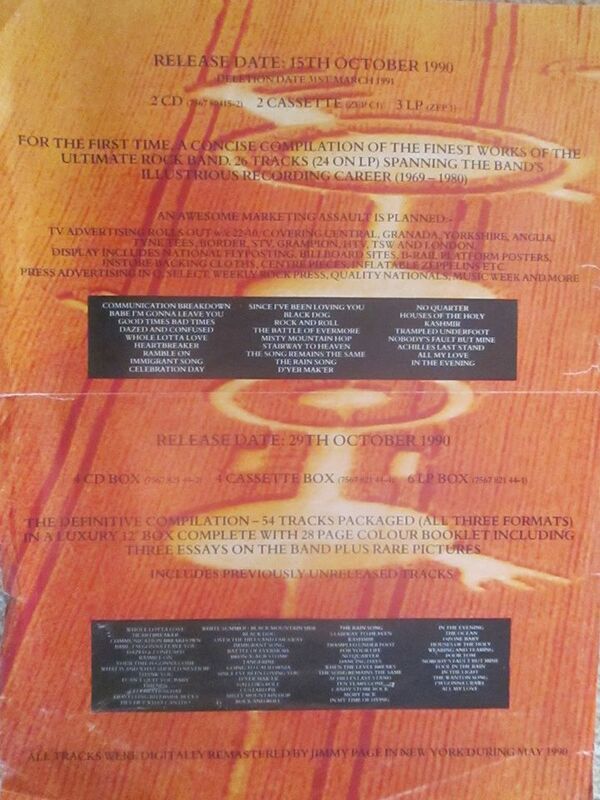 Thus the arrival in October of 1990 of the five LP CD box set and double Remasters compilations was a very big deal indeed. I wasn’t the only one I am sure, who had not paid much attention to the studio albums in recent years. My Zep listening time was taken up analysing the many Zep shows that were appearing on CD sets and the fresh outtakes that had surfaced. The arrival of the Remasters was a revelation. Suddenly we all realised just exactly what it was that had made this band so special. Lapsed fans got back on the wagon –a whole new generation of younger enthusiasts also jumped aboard. 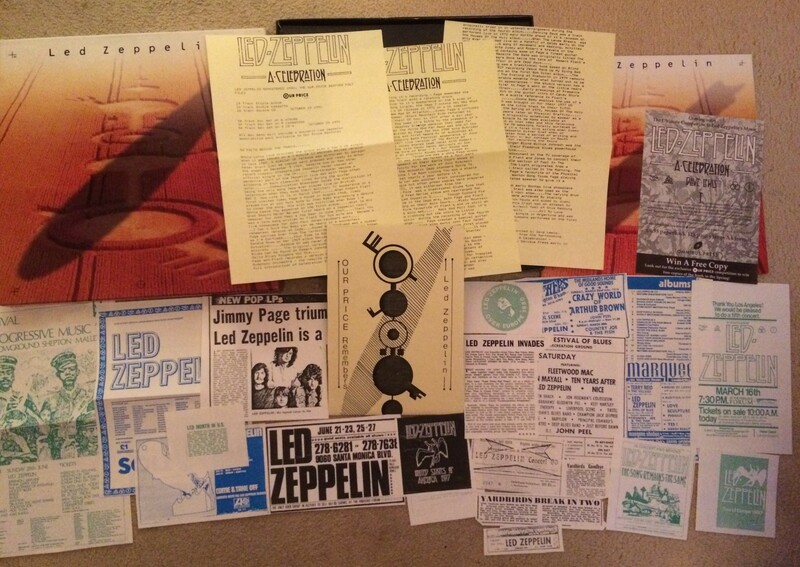 Overnight Led Zep’s stock shot up…and it never looked back. The Remasters releases were absolute game changers in the way Led Zeppelin were viewed and appreciated. I have very fond memories of this period 27 years ago – it was the point where I realised their legacy was intact. It was fantastic to follow all the media buzz that went with it including Jimmy’s appearances on MTV and the promo videos for Travellin’ Riverside Blues and Over The Hills And Far Away. In the Our Price record store I managed in Bedford we really went to town – with pre release build up and in store displays and we produced an exclusive memorabilia pack given free with each purchase. 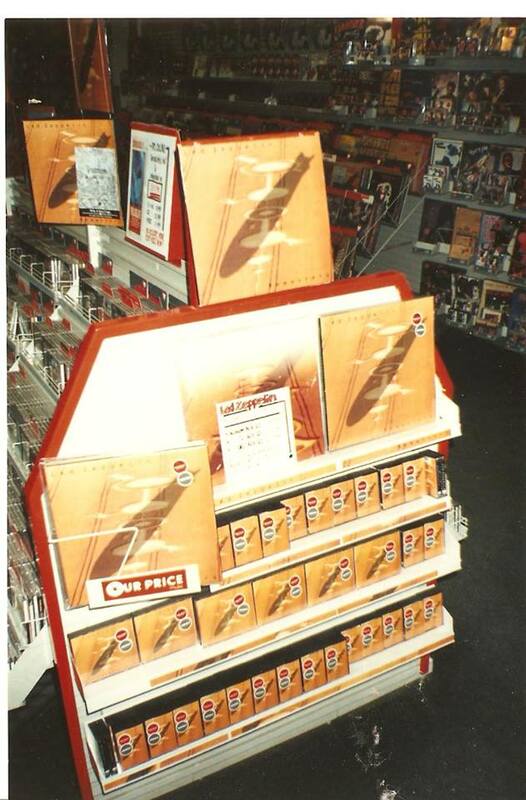 This activity resulted in the store racking up £10,000 worth of business on the box sets and double albums. I was later awarded a triple gold disc award by Warners in the UK. it was an incredible thrill to be acknowledged in this way. At the time, I was about to produce a book that emphatically chronicled the band’s music. 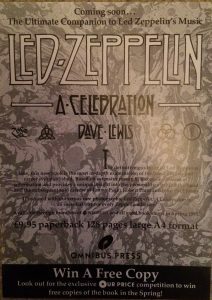 The book Led Zeppelin – A Celebration published the next summer was very well received…and it set me on a mission to totally commit myself to chronicling the world of Led Zeppelin that has not let up for the past quarter of a century. And what vivid pictures they are…. 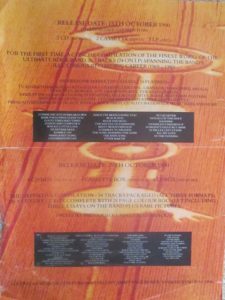 I recently re- acquired a piece of my Remasters heritage – for some reason, I never kept the Our Price exclusive memorabilia pack we produced at the shop. At Darren’s Vinyl Barn a few weeks back a regular customer brought in a Remasters box set tot sell – and lo and behold it contained the ordinal Our Price memorabilia pack -number 64 of the limited run we did of 100. Needless to say, I snapped it up. 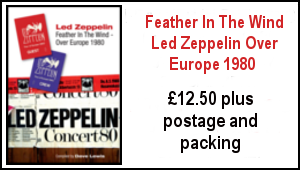 Under the title ‘Our Price Remembers Led Zeppelin’ the pack contains a number of fascmile reproduction ads and cutting. These were drawn from my collection and I took them to the local photo copy shop Jaycopy (who had produced the early TBL magazines). It took hours of cuttings out to produce the 100 sets. I also wrote a three page 54 FACTS BEHIND THE TRACKS guide drawn from material in the book – this was photocopied off my word processor. The outer envelope was designed by my then assistant manager at the shop Colin Stonebride – Oh what fun we had! Finally the Our Price marketing team trailed a completion to win copies of the book when published and Omnibus Press produced a flyer which we also put in the pack. 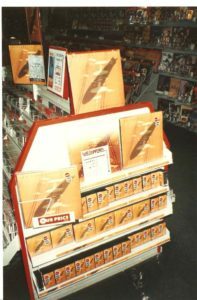 All this illustrates that my enthusiasm was running wild back then in 1990 – finally Led Zeppelin were right back in vogue and I wanted to be right at the forefront relaying that message. 27 years on, nothing much has changed…. DL – November 1, 2017. Here’s a final summary of the remarkable events unfolding five years ago…there’s some very passionate observations here.. Jumping on the last train…here is my take on Celebration Day. I celebrated the day at the Budokan…er, no, the Cineworld in Stockport (of all places). For the 8:45 pm screening, the second and last of the day, the seats were occupied by some fifty people, about 1/4 full, quite a modest number, I have to say, for the town that once hosted a number of rock greats, namely The Who, Cream, Hendrix (twice! ), Pink Floyd, Family etc (not Zeppelin, though). The volume was okay, though a little bit on the quiet side for my liking. However, it didn’t benefit from the surround system in particular (at least I didn’t feel it). The greatest thing about the film is, above all, it made me feel like I was part of the event myself in some way or other. As compared with this, the fast cuts/quick editing and the use of grainy shots, the two major faults pointed out in some quarters — more often elsewhere than here, perhaps — are minor gripes, even though I agree with the points being made. I was lucky enough to be there too. Wish there were more crowd shots!! I was about 7 deep off center on the floor. Turned up at Vue Cinema in Harrow for the 2.30pm screening yesterday, resplendent in my replica white Knebworth t-shirt (the original one purchased in a field in Hertfordshire on 4th August ’79 sadly long gone). I expected a real crowd but there were no more than about fifty people there. Looks like I went to the wrong Vue Cinema, DL!! Truly blown away by the whole experience, I soon forgot the place was half empty and did my little bit to get the ‘crowd’ going. Highlights for me, song-wise, were Nobody’s Fault and No Quarter, plus my own favourite Kashmir which was awesome and “The Pride of Led Zeppelin” as Percy once said. Second highlight was Jason Bonham who worked so hard for the boys and I loved the little glances and smiles he got from them. He didn’t need any encouragement but maybe it was more reassurance that his old man would have been very very proud indeed. Saw Celebration Day on Oct 17th premiere in Montreal. -Jimmy – I was in emotional shock and awe at watching him play his heart out. This man can play guitar so passionately and differently each and every time. He is ageing so gracefully, he must be spending time in the mountains of Japan !!!! -Jason – Amazing, world-class. Wish there was more camera time on him but I guess that would have meant less camera on the others. and in my mind stands on his own feet in the company of the top 10 drummers in the world but has the edge due to the Bonham family sound. -Robert – The voice and swag in full form, part of a band. twists and swagger. Very emotional. The biggest surprise – Dazed and confused. Felt like I heard it for the first time. Dark, edgy and moody. My song thoughts after the show (next day). Same as day of show but now feeling emotional crash. Could this really be the end. What other songs did they perform in rehearsals, was it filmed ? Will they ever share them ? Did they record anything new ? Songs in my head that I would love to hear live. Can you imagine……….Achilles last stand, Carouselambra, All my love, When the Levele breaks, The lemon song, an acoustic set, custard pie. Pre-show press conference(s). Found them fascinating while also noting that we had a rare glimpse into the privacy that surrounds the band. They did it their way and still do. Peter Grant’s influence was/is/remains a major factor. JPJ appears to acknowledge this while the others remain silent. Ahmet Ertegun – the entire band loved this man. Is there another man on earth that influenced Zep boys as much as him? Jimmy Page seems to carry the emotions of ZEP on his sleeve, the others less so. I hope he is at peace. I went to see the film at Edinburgh with my daughter. 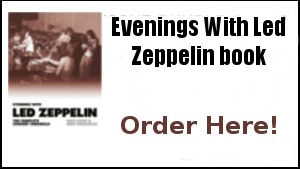 Having followed Zep since the early seventies but never having seen them live my anticipation prior to the film, which was heightened by the tbl website, was high and I was not disappointed. 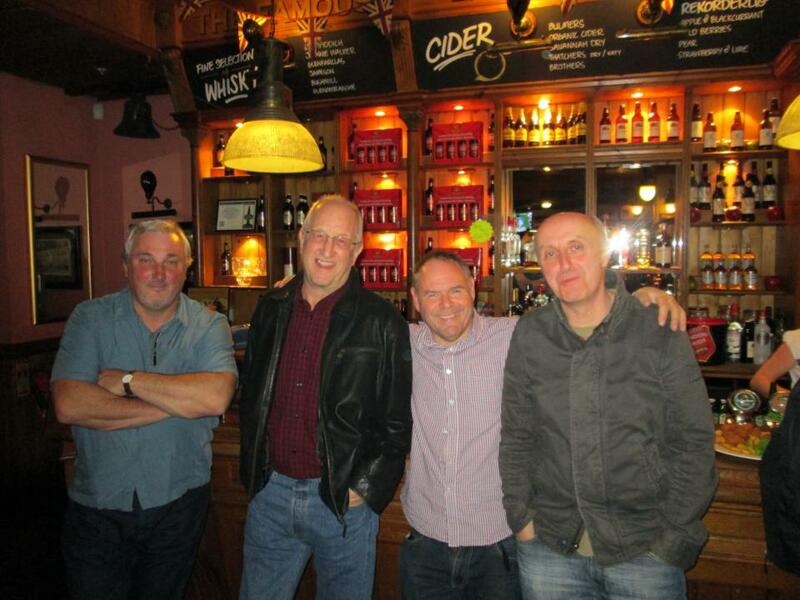 The cinema was fairly full with a mixture of age groups but mainly middle aged balding blokes like myself. The quality of the performance was second to none and it was clear from the fantastic camera work how much the band were enjoying themselves and that they knew they were on top form. For me the highlight was the supreme performance given by Page. His guitar playing was unbelievable. My daughter said to me when we were leaving the cinema that Page has still got it even at his age. (she is only 26). An unforgettable night and I’m doing it all again on Sunday as the cinema is showing the film again. Paul. Loved the build up to Celebration Day at the cinema’s. I went to see the film at Solihull Cineworld, the daughter of my friend works there so we got in for free. Nice bonus. The film itself was brilliant, but the sound in Solihull was way too quiet, I could hear a gentlemen on the other side of the isle from me tapping his hand on the arm rest above the sound of the film!! I am not kidding, so as a result it lost some of its dynamics. After 3 songs in I said to Simon who was sitting next to me (who saw Zep 3 times in B’ham in the early 70’s) that it was way too quiet and he agreed. Another friend of mine went to Vue Cinema’s on Sunday afternoon in Star City B’ham and she said the sound was nice& loud & afterwards had felt that she had been to a gig. What a difference a bit more presence makes (no pun intended). I did notice during the film that Roberts little‘humming bee’ bit had been edited out of In My Time of Dying, but I agree with you seeing the bands little nodds, smiles and raising of eyebrows for their cues was great and to see John Bonham’s logo on the under side of Jason’s cymbals was nice touch. As too was JPJ’s logo covering the truss rod where the neck of his bass joined the body. Will I buy the deluxe DVD in November? Definitely. I have the Shepperton Rehearsals on CD and they are amazing as well so am glad they are included. It will be interesting to see if the missing vocal line on Stairway has been added. There was one more Celebration Day fix for the TBL crew on Sunday at the Westfield Centre. 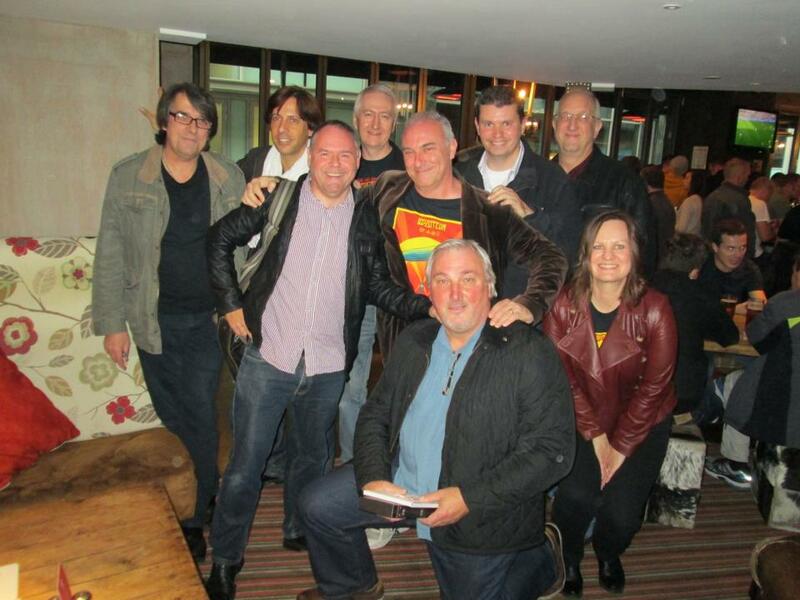 Another great turn out with Gary Foy, Cliff the ticket man, his lady Tracy, Dave Linwood and his friend Nigel a Zep virgin up until then, Lee Matthews, Andreas Stocker, Krys Jantzen, Ian Avey, Michaela, Dan and Charlie and the Earls Court Bedford four of myself, Phil, Dec and Tom watching Led Zeppelin in the same row as we had watched Led Zeppelin together back on May 24th 1975. Above – With Dave Linwood – the creator of TBL web – TBL crew at Westfield Centre Celebration Day pre-screening meet last Sunday. The Vue cinema was excellent with a fantastic view and de-luxe seating and a giant screen. It did take three numbers to warm up but the surround sound was very effective. This all made for another memorable experience in the company of this astonishing film. Once again there were fresh new little nuances to discover…Jonesy’s grin as they came out of No Quarter, Robert deploying the Yallah vocal effect on The Song Remains The Same, a deft cutaway to a pleasing cherubic grin from Jimmy as Robert sings the line ‘’Why don’t you take a good look at yourself and describe what you see’’ during Misty Mountain Hop. 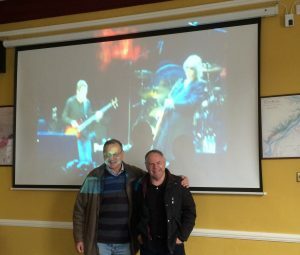 Afterwards, yes beers were drunk and stories told in the usual fashion and then it was home to face a Monday morning where the question might well have been Is there life after Celebration Day? Tom, Phil, DL, Dec: The TBL Earls Court Bedford veterans – second row Led Zeppelin May 24th 1975…still in the same row together Celebration Day Oct 21 2012 –combined Led Zeppelin gigs attended = 29 –combined Celebration Day film screenings = 11…combined ages = 222 but still rockin….just ! From the announcement and airing of the Celebration Day trailer via the official Zep site on Thursday September 14th through to my final screening on Sunday October 21st its been 39 glorious days. 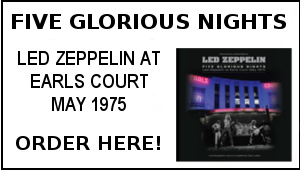 There really has been no period quite like it since…well the 02 concert of five years back… this has been something very special indeed ,because this time there has been no exclusivity, this film is a communal event for all Led Zeppelin fans to share. I’ve enjoyed some pretty amazing times in my enthusiasm for Led Zeppelin over the past four decades but I have to say this past month ranks as perhaps the most enjoyable of them all -it’s been to quote myself..simply joyous…I could get pretty deep and meaningful about the whole experience – suffice to say I feel absolutely blessed to have witnessed this simply remarkable period. 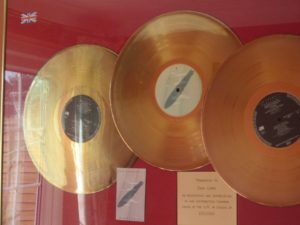 The unfolding Celebration Day saga with all the social media at its disposal has been perhaps the biggest media shout of Led Zeppelin’s entire career. Two press conferences reuniting the three ex members, four premieres ,two of them again with all members present, many an interview, many a comment and blanket coverage on line and in the press. There is little doubt that during these past 39 days Led Zeppelin have once again been the most popular band on the planet. For me personally these past 39 days have been a roller-coaster ride to say the least. Juggling various issues back here, not least a few health ones amongst us , attending book launches, finishing up and distributing TBL 33, arranging tickets and travel (thanks for your help Michaela! ), it’s been invigorating, exhilarating and not a little emotional. Attending that initial press screening and press conference has to be right up there with my all time amazing Zep experiences. 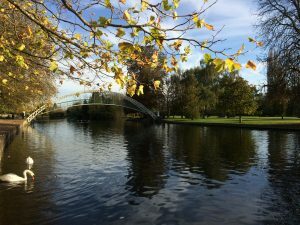 Writing my impassioned review the next day was one of the hardest tasks I’ve undertaken in conveying emotions to words…now you have all seen the film I think you can empathise why…hey I was right all along! 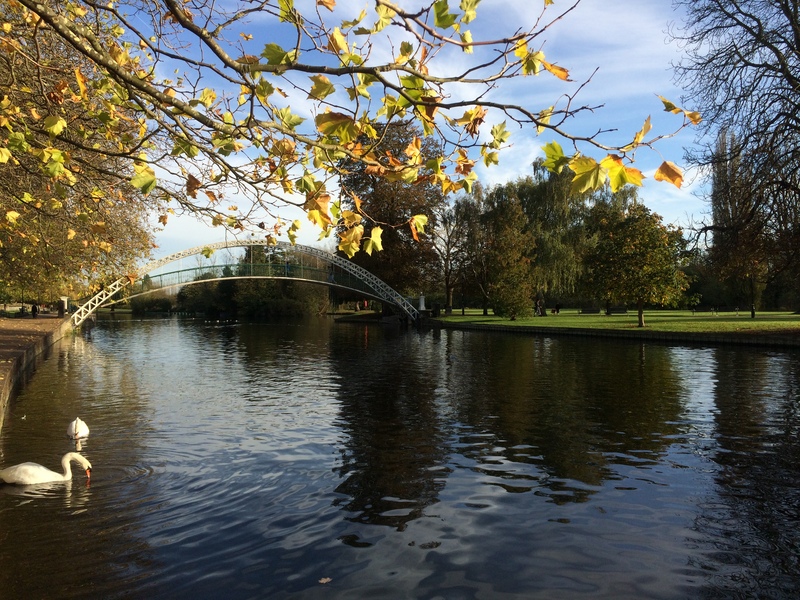 The TBL daily newsletter countdown – now that was a challenge in itself and yes sleep was at a premium but again it has been a sheer privilege in enhancing the build up to the October 17th Celebration Day. The London Premiere: Another night of nights – perhaps the greatest of ll -an incredibly exciting experience as they strode the red carpet. When is a film not a film? When it’s Led Zeppelin live at the Hammersmith Apollo. It genuinely felt like a gig…and one of the greatest. Some observations on the film: Jason – an amazing performance –seeped in the emotion of his dad..…the film also identifies how important John Paul Jones has always been to it all…Jimmy Page is just totally immersed in Led Zeppelin again – has any musician looked so happy and glorious as did James Patrick Page throughout the 124 minutes…..Robert Plant –more than anything else, this film shows his utter rejuvenation. For one night only he was once again the frontman of Led Zeppelin. He took to the task with utter conviction…in many ways he is the real hero of the 02 reunion because he really did want to be that man again…this film is ample proof of what a frontman he really is – a compelling performance throughout that says everything about his ability to get right back into character and make all look so effortless…absolutely utterly masterful. There’s a parallel to be drawn here ….what has also struck me during these 39 golden days is a similar sense of camaraderie amongst fans –be it on Facebook, this site, other message boards or in the cinema (and pub beforehand!) –I personally have reconnected with so many likeminded fans and met many new ones. It was particularly pleasing for me that along the way the good lady Janet and Sam got to see the film along with many of my friends and of course being reunited with the Earls Court Bedford veterans last Sunday to watch the film some 37 years after we attended the Saturday May 24th Earls Court show as mere teenagers was a special thrill. Aside from the amazing music, that is what this thing has always done. 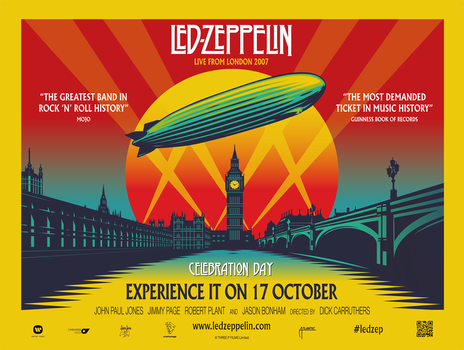 Celebration Day has succeeded in bringing together Led Zeppelin fans of all ages from all over the globe…and I’d like to think that Tight But Loose in all its mediums has played its part in that achievement. As many others have noted, there is an air of finality about the release of this film –it may well be the last gathering of both musicians and fans to celebrate the legacy of Led Zeppelin – certainly on such a worldwide scale. Therefore I did feel more than a slight pang of sadness when the credits rolled at the end of the film on Sunday. If this the end …well what an ending. What a glorious, glorious ending…. Is there life after Led Zeppelin’s Celebration Day? And of course the answer is an emphatic yes. The four musicians up on stage at the 02 Arena for Ahmet are forever immortalised and united as Led Zeppelin on that night – away from the screen, once again they are Jimmy Page, Robert Plant, John Paul Jones and Jason Bonham, musicians in their own right. There has also been more than a hint that there will be some sort of remastering and repackaging of the Zeppelin catalogue which we all crave. Given a Pink Floyd type makeover with unreleased outtakes, alternate versions, vinyl re issues ,well we could be in for a real treat ahead. So maybe it’s a case of Led Zeppelin is dead…long live Led Zeppelin. Before too long we of course will have the DVD/blue ray/CD to add to our apprecation of it all (24 days and counting down). The exclusive airing of Kashmir on the Ken Bruce show on BBC Radio 2 yesterday morning caused much excitement…its sounded awesome streaming out of the radio, just as Whole Lotta Love did all those years back around this time in 1969 – a moment that kick-started my particular enduring love affair with this band. So if this is goodbye…well, it’s going to be a long one and this web site, via the TBL magazines and books, will be there waving them off on every step of the way. The Celebration Day film has proved to so many fans across the globe why Led Zeppelin are forever in the present tense and it’s like I rather excitably relayed to Front Row Dave in the Distillers pub before the première screening ( see YouTube clip below)…this is not just band….this is a way of life and long may this astonishing band be a substantial part of it. 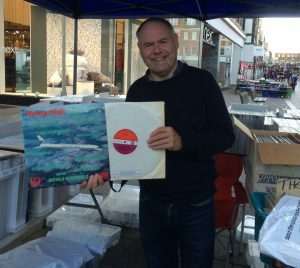 Friday treats at the Vinyl Barn: At the always excellent Vinyl Barn last week, I was well pleased to find a copy of the 1969 UK Atlantic Records/JAL Airlines promo sampler Flying High – catalogue number 588 194 issued in between Zep I and II –it features You Shook Me –top result! Thanks Darren Harte. And yet more Friday treats: As Darren had a week off the week before , I made up some lost ground by making a return visit to the Vinyl Barn – this time I secured a copy of Stephen Stills 1978 Thoroughfare Gap album on CBS and an original UK Polydor pressing of Slade’s great 1970 album Play It Loud, which features the superb Pouk Hill, Know Who You Are and The Shape Of Things To Come – another top result supplied by the number one record stall for miles around.Weekend playlist sorted, It was back to work on the in progress Zep book in the afternoon with a renewed spring in the step – ahh records…so good for the soul..! 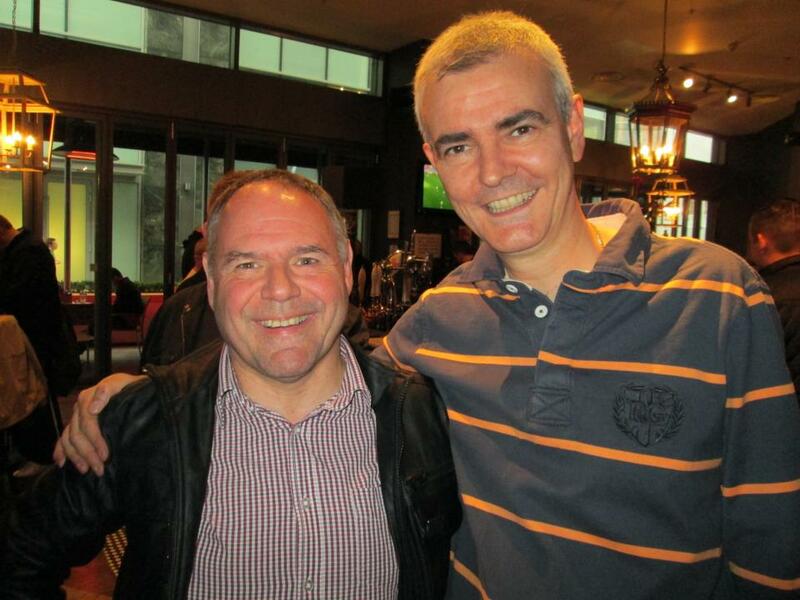 Last Saturday It was great to watch the Man Utd v Spurs match in the Fox and Hounds with my good friend Sean D’Arcy . Sean’s a Utd fan so having known him since I was 8 years old we have seen a few encounters between out teams over the years –United td came out on top 1-0 but it was a close thing…and yes we did miss that man Kane. 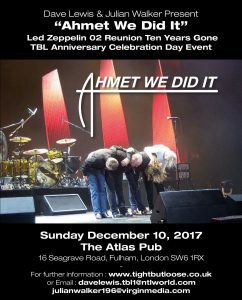 November is upon us and it’s going to be very full on with Robert Plant’s tour kicking off, the Olympia Record Fair and here more ongoing work on the Evenings With Book and launching the ”Ahmet We Did It” TBL 02 Arena Ten Years Gone Reunion event. With the book, we are at a review stage of the 300 pages so far completed in design. It’s a case of going back and tweaking anything that’s not quite right, updating some visuals and generally tightening it all up. This is intensive stuff and a fair few of our waking hours are going into it all. Away from the workload, the good lady Janet and I will be celebrating our good friend Max Harris’ birthday this weekend. The studio version of Ramble On is generally the best way to test a recently unblocked ear. And I’d love to know what Zeppelin material is being mastered by John Davis… theories anyone..? Dave, do you know but are sworn to secrecy…?